Microsoft is the latest tech firm to be accused of gender discrimination. The company was hit with a class-action lawsuit in a federal court in Washington state Wednesday. A former employee, Katie Moussouris, charges that the company unfairly discriminated against her -- and other female workers -- because of their gender. Moussouris was hired as a security program manager at Microsoft in 2007. The suit alleges that she was passed over for more than one promotion while male colleagues, who were less qualified, were promoted. The company relied on sexist policies that violate Title VII and the Washington Law Against Discrimination, according to the suit. The suit cites "stack ranking" as particularly unfair to women. Microsoft used this numerical ranking system through 2014 to evaluate, compensate and promote employees. According to the lawsuit, female technical workers typically received lower scores than their male peers. "It is an artificial system that requires winners and losers," said Kelly Dermody, attorney at Lieff Cabraser Heimann & Bernstein, one of two firms representing Moussouris. "There's no performance-based need to do that." Separately, Moussouris made internal complaints about a superior sexually harassing her female colleagues. Even though Microsoft found these allegations to have merit, it merely reassigned him. Moussouris claims he retaliated against her by giving her a low bonus and diminishing her responsibilities. Moussouris is a visiting scholar at MIT's Sloan School of Business and a New America Foundation Fellow. She left Microsoft (MSFT) in May 2014, after working for the company for seven years. She is now chief policy officer for HackerOne, a cybersecurity startup. 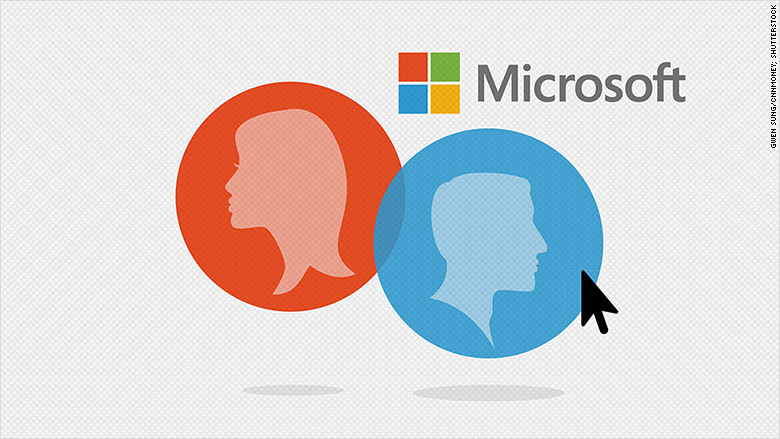 Microsoft's workforce is 76% male. The lack of diversity is even more apparent at the executive level, which is 88% male. In a statement, Microsoft said it was "committed to a diverse workforce." "We've previously reviewed the plaintiff's allegations about her specific experience and did not find anything to substantiate those claims, and we will carefully review this new complaint." Microsoft isn't the first tech firm to have its internal policies called into question. A Twitter (TWTR) lawsuit, filed earlier this year, also alleges that the company has promotional practices that prevent women from moving up its corporate ladder.